Step down to this basement shop where satin bathrobes and racy, lace babydolls will be the first things you see on display. 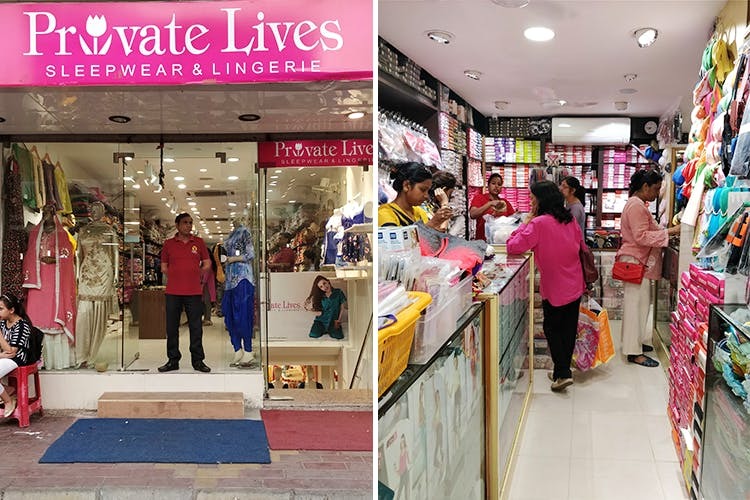 Stroll through and peruse the store, and you’ll come across their pretty (and colourful) collection of bras, lingerie sets, nightsuits, rayon cotton track pants, and disposable underwear. Their range of dailywear cotton bras begin at INR 500. They also have really cute, printed bra boxes for INR 999 that’ll make sure your newly-bought goodies are well preserved. Right next to Incense is this small store, where you can score branded (but still affordable) dailywear stuff from Amante, Enamor and Jockey. Don’t know what your cup size is? Let the trained women here help you out. The (minimum) damage to your pocket here is INR 340 for a padded, cotton bra from Bodycare. Save this one for if you prefer your intimate wear subtle and simple. Pile up your stash with some solid-coloured sets from this store. From hosiery, net and lycra to cotton and lace, this store has it all (the price range kicks off from INR 500). They’ve got some cheaper options for anyone who wants their lingerie to rank high on the dressy sale. You can also check out the two, four, and eight piece bridal packs. The latter has a bra set, a negligee, a satin robe, a night dress and two different PJ sets – all for INR 2,400. This two-storey store has nightgowns on the ground floor, and all the reliable basics in the basement. You’ll find wired as well as non-wired bras, seamless underwear, lingerie sets, bathrobes, negligees, garters, thongs and silicon cups. Women who’ve cried about never finding the right size since they’re on the heavier side of the spectrum – they sell cup sizes from a B to an I! Their collection is mostly from legit brands, and begins at INR 645. Though it’s less fancy and more compact than the others on the list, it’s also the most pocket-friendly of the lot. (Definitely worth becoming your new go-to for all full coverage cottons). The padded bras start at INR 325, and the sets for INR 650. You’ll find it next to KFC – watch out for the staircase right next to it. If you don’t know where it is, it’s easy to miss it.